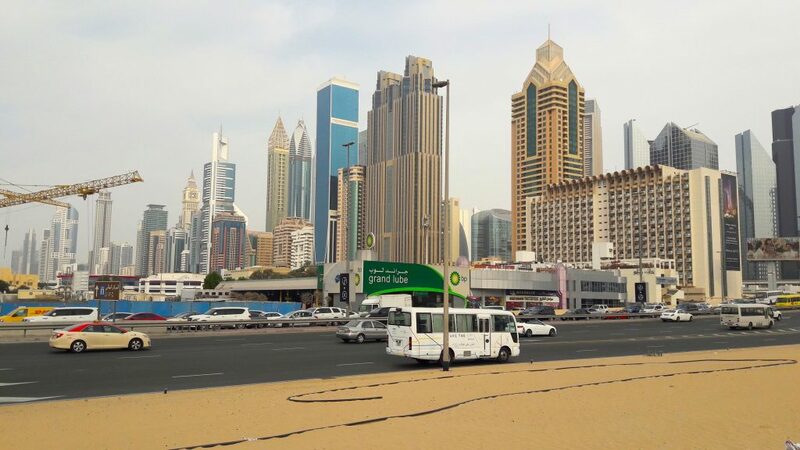 Everything about Dubai made my head spin. On many occasions I felt like a tiny ant lost in a mechanical world. More than once I had to abandon journeys on foot because giant buildings and 12 lanes of traffic came between me and my destination. Though at times I felt frustrated by this mad artificial universe, I was also equally amazed and overwhelmed with awe. More than once I was reduced to tears by the magnificence of this strange metropolis. 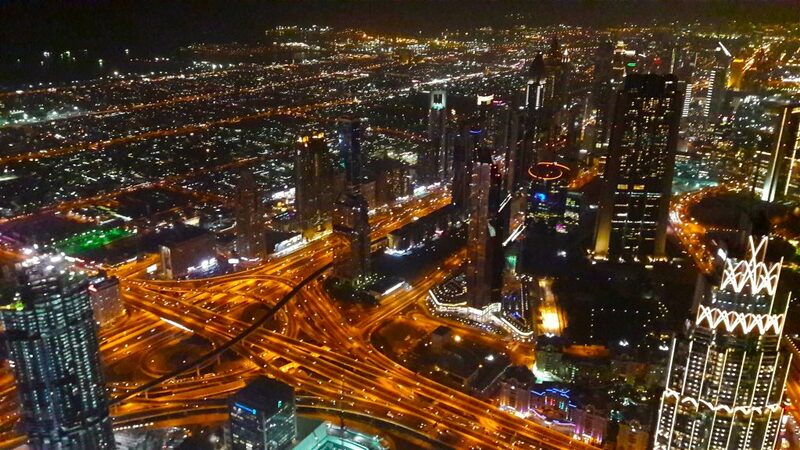 Seeing the glittering lights of the city from the top of the tallest building in the world was an undeniably special moment for me. 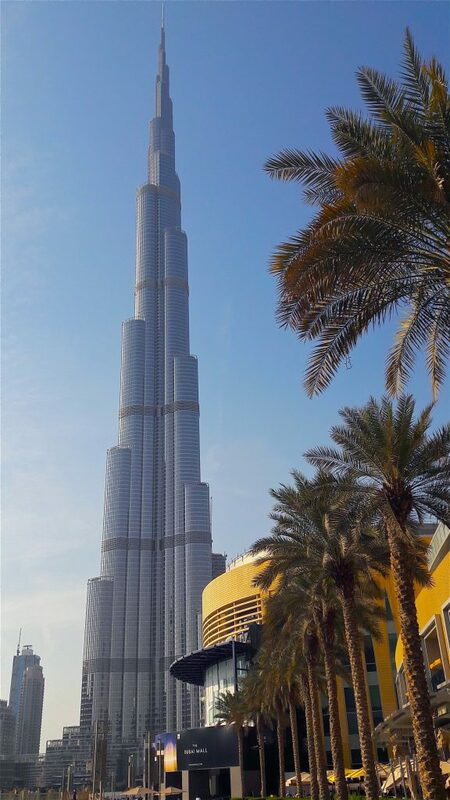 I’d desperately wanted to visit the Burj Khalifa since I first heard of the plans to build it. The fairy tale like quality of a tower stretching up nearly a kilometer (830m to be exact) into the sky spoke to my inner child in a powerful way! The experience was made all the more dramatic by the fact I nearly missed my slot to visit. I had to run through a seemingly never-ending tunnel of moving walkways to get there, just in time to use my extremely expensive non-refundable ticket. 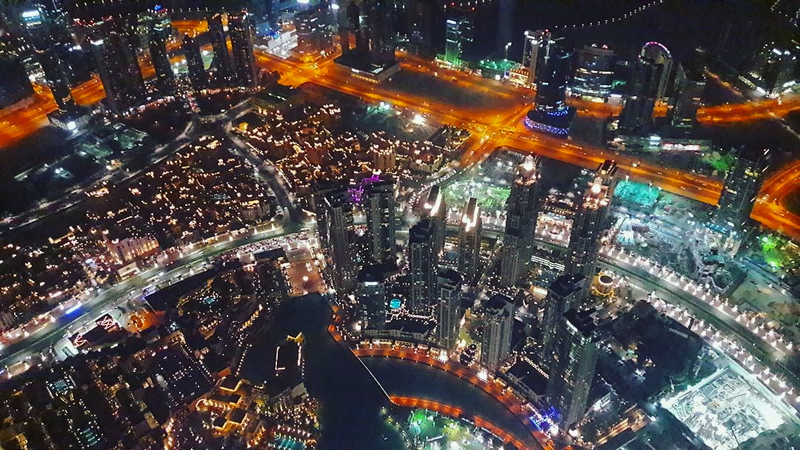 The relief, combined with a journey to the top in an elevator traveling up to 10 meters per second, left me feeling like I’d been reborn, as I suddenly found myself ejected onto the 148th floor observation deck! Giant skyscrapers looked like tiny toy buildings beneath me. 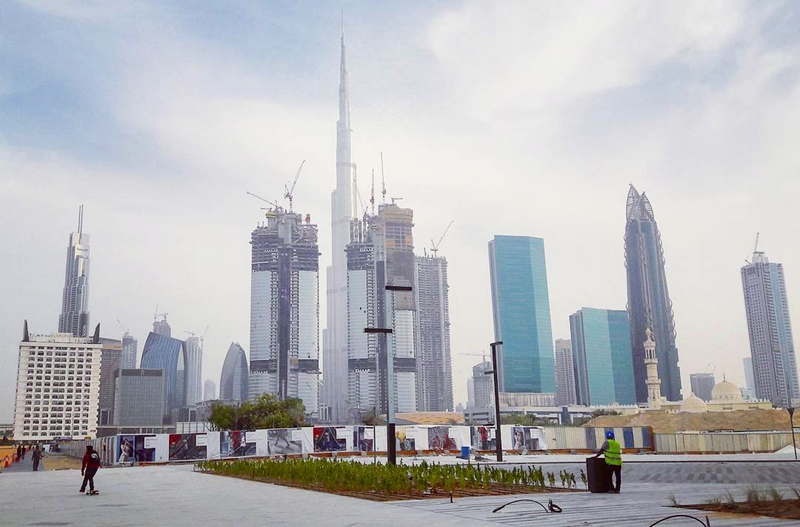 Dubai wasn’t dwarfed by the soaring tower though. My bird’s eye view allowed me to witness its sheer scale, ever-expanding into the surrounding desert. I was also mesmerized by the most impressive intersection of roads I have ever seen, allowing miniature cars to glide with ease through the city and beyond. I came back down to earth with even more appreciation for the construction of this unbelievable place. I’d experienced the Burj Khalifa from the ground for the first time a couple of days before. 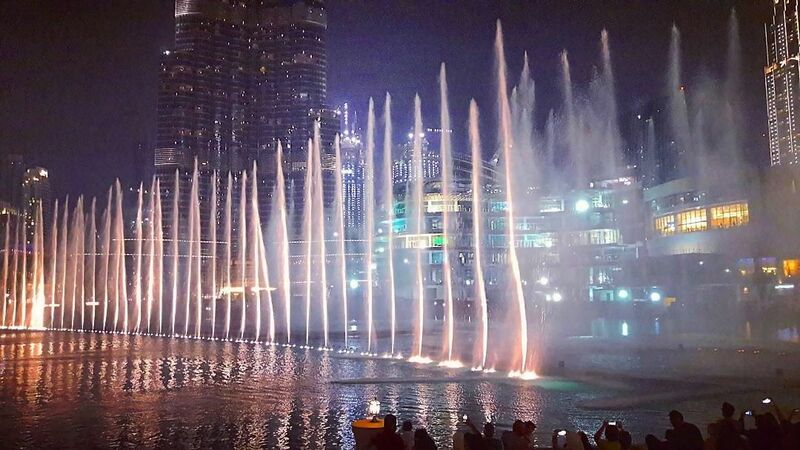 Every evening there is the spectacle of the Dubai Fountain, where water, music and light are used to create pure magic in front of the glistening tower. This show is repeated several times throughout the evening and is free for everyone to enjoy. 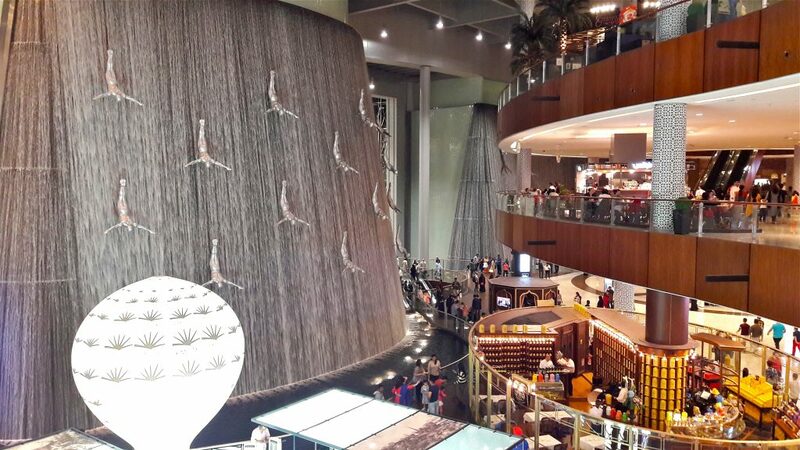 Strolling through the Dubai Mall was another of my favourite activities. Hearing the call to prayer reverberate through the huge shopping centre was an extremely powerful experience. 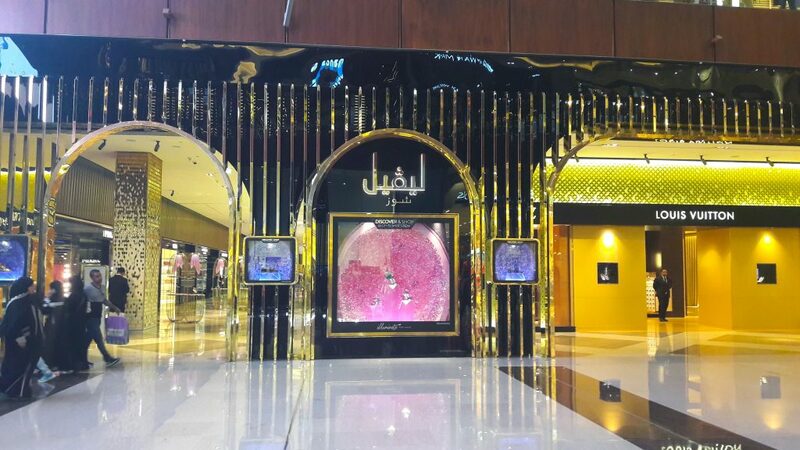 It was strange to witness this against the backdrop of such large scale consumerism, but the pristine shiny chambers provided the perfect acoustics, and actually enhanced the effect of the beautiful spiritual song. When the hypnotic waves of melodic perfection had finished penetrating my soul, I was off to see the giant aquarium! 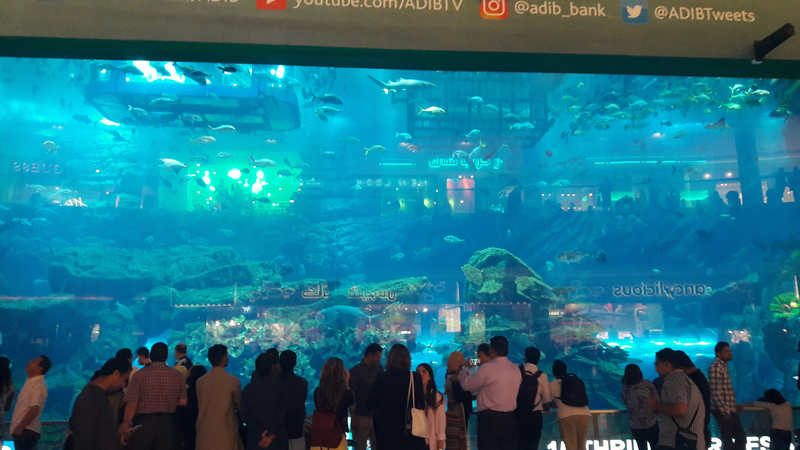 There is something for everyone in the Dubai Mall. As well as watching the beautiful sea creatures, I loved to watch the people watching them. There was always a row of people happily pointing and taking pictures of the large section of the aquarium that is free to the general public. Another relaxing place to while away the hours in the mall is at the waterfall. I wish we had waterfalls in our shopping centers at home, maybe people would be a little less stressed! 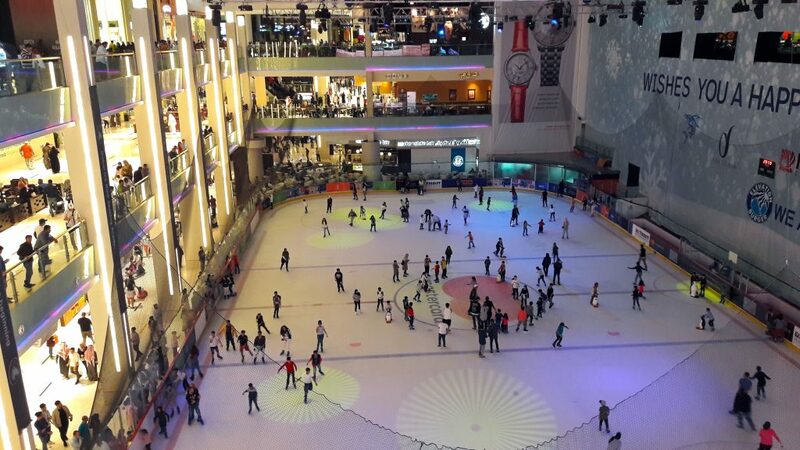 If fake waterfalls aren’t your thing, there’s always the olympic sized ice rink, indoor theme park or cinema. The possibilities for non-shopping related activities are endless. I can’t comment on the shopping as I didn’t do any, but I can imagine the joy that over 1200 shops in such lovely surroundings would bring to an avid shopper! All the air conditioned malls, tunnels and towers left me craving the outside (a place that I frequently forgot existed here!). It is VERY difficult to walk anywhere in Dubai though, as my disastrous attempt at visiting the Ras Al Khor wildlife sanctuary demonstrated. After getting within 500 meters of the place on the bus, I was forced to abandon my trip due to a fenced highway between me and my destination that was impossible to cross. This experience made the successful walks all the more enjoyable. 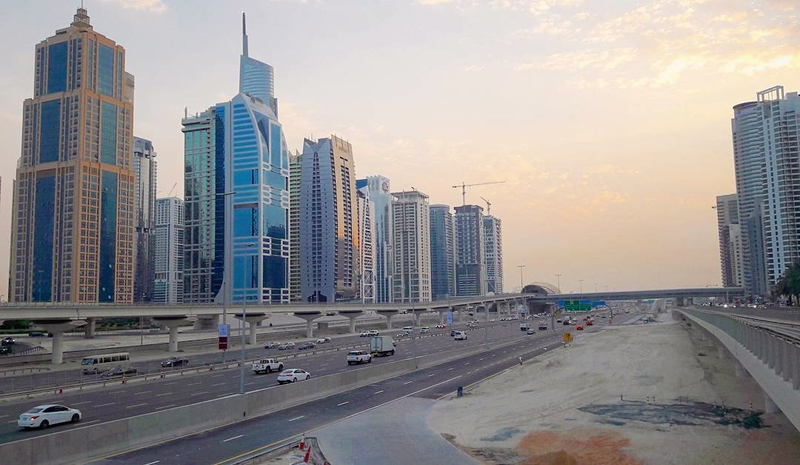 I managed to navigate my way along tiny pavements, through, under and across vast roads and buildings, out into a space open enough to observe the majestic skyline. It was the marina that really stole my heart though. There is magic everywhere we go, but near the water it’s much easier to see it! All the shades of sunset reflected in the gentle ripples, and combined with the twinkling city lights to create an enticing glow, inviting me to stay. 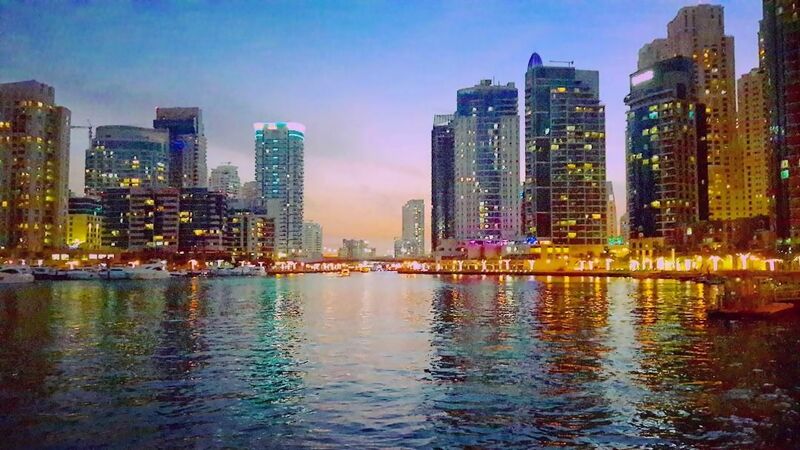 I longed to jump into the water, buy a boat, or live in a glittering apartment overlooking the beautiful marina. Anything to be a part of this special place. But instead, I took a piece of it with me to hold in my imagination and my dreams. That’s how I cope with leaving places I love all over the world. They leave impressions on me that I couldn’t leave behind if I wanted to. This entry was posted in Travel on January 29, 2017 by tessheaven.